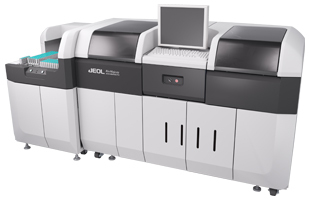 Clinical Biochemistry Analyzer(CA) | Introduction to JEOL Products | JEOL Ltd. The Clinical Biochemistry Analyzer is an instrument that uses the pale yellow supernatant portion (serum) of centrifuged blood sample or a urine sample, and induces reactions using reagents to measure various components, such as sugar, cholesterol, protein, enzyme, etc. These tests are performed for routine health checks or at hospitals, and the results provide objective data enabling early detection and diagnosis of disease, as well as indicating the effects of treatment and patient prognosis. In addition, due to the increasing costs of medical care, medical equipment is also expected to be economically efficient. BioMajesty™ is the most economical instrument on the market, using micro volume of samples and reagents to deliver highly-accurate, high-speed processing through the incorporation of a sample dilution tray, which is an outstanding unique feature of BioMajesty™ analyzers. Furthermore, we have developed the Laboratory Information Systems as well as the Laboratory Automation Systems, offering a total support to our customers and streamlining the everyday laboratory activities.disc which is not available from other makers. Moreover, our company has developed products for test information systems as well as a total sample automatic transfer system to support all activities from drawing blood to reporting; , allowing remarkable improvements in the speed and efficiency of clinical testing work. This urea is filtered by the kidney and excreted as urine under ordinary circumstances. However, if the kidney fails to work properly, the unfiltered urea remains in the blood, so the urea nitrogen level in blood becomes high. On the other hand, creatinine is a break-down product (final metabolite) which is produced when muscles move, and this is also absorbed and excreted by the kidney. Therefore, if significant quantities of these substances exist in the blood, it can indicate the possibility that the function of the kidney has declined. For a healthy adult the upper limit for creatinine is 1.2mg (1.2g/1,000) in 100ml (1dl) of blood serum. If more than this quantity is detected, the kidney function is considered suspicious. This example is for the kidney. There are other indicators, such as for hepatic function using transaminase (AST or GOT, ALT or GPT), cholesterol, and bilirubin concentrations, and for diabetes using blood glucose (Glu) concentration and diastatic hemoglobinA1C fraction percentage (indicated with %), and so on. The concentrations of various substances in the blood can tell us a great deal about the clinical state. Today’s medicine requires this kind of test data to make accurate diagnoses. This area is called biochemical examination in clinical testing. BioMajesty™ is an automatic analyzer for biochemical testing, and it can analyze more than 100 different components in blood. The measurement principle is as follows. You may recall the iodine-starch reaction experiment from a school science class. When you add iodine solution to a starch solution, the solution will turn blue instantly. The existence of starch can be confirmed in this way. In addition, if saliva is added to the colored solution, the color will disappear. This is because the starch is dissolved by the function of an enzyme called amylase contained in saliva. An automatic biochemical analyzer utilizes this kind of reaction, and converts the quantity of a specific substance in blood into an amount of color change for measurement. The analysis method of measuring the amount of color change is called the colorimetric analysis method. The origin of this method is quite old, and the shading of colors was originally evaluated by the naked eye. It is a method that has been used since the age of alchemy. 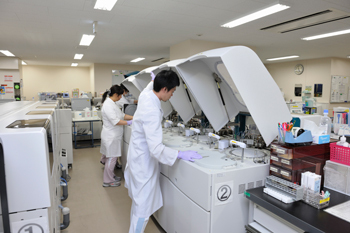 The automatic biochemical analyzer has automated the sequence of operation processes which used to be conducted by hand and evaluated by eye (or using a spectrophotometer) in the past. The samples for BioMajesty™ are the pale yellow liquid portion of blood called blood serum, and urine. A certain precise volume of sample (normally 30 micro liters) is collected by using a dilution pipette, and diluted by 5 times using a dilution disc. The measurable sample is 150 micro liters (μl). 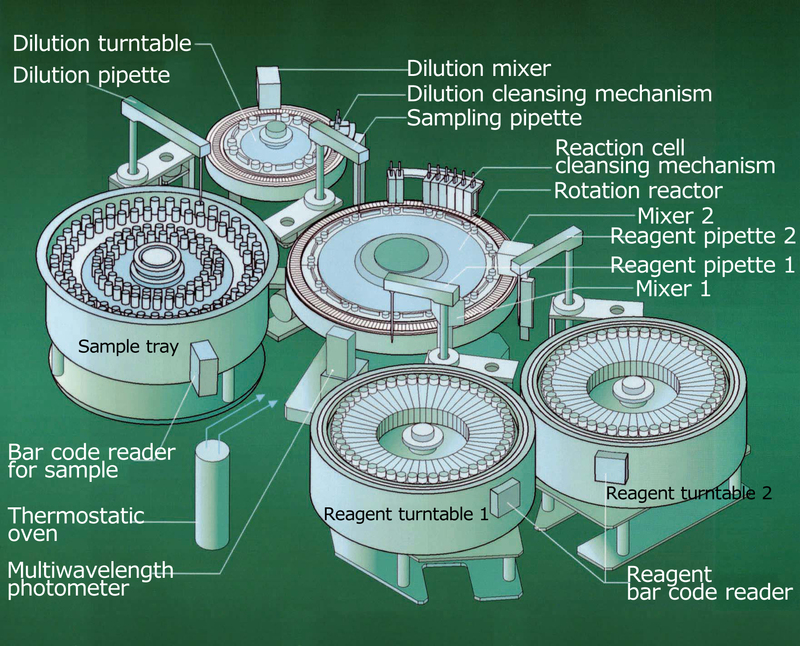 From this dilution sample, a precisely-measured amount of 2 to 25 microliters per test item is transferred to a reaction cell (1 eye drop in the rotating reactor is about 40 microliters). The reaction cell already contains reagent transferred from the reagent bottle in reagent turntable 1. Reactions are induced in the samples in the reaction cells at a temperature of 37μ. If a color reaction does not occur with one kind of reagent, it is possible to add a second or third kind of reagent (reagent turn table 2). After allowing the reaction to proceed for a certain time (normally 10 minutes), the color density is measured by using a colorimeter (in the figure, “multi-wavelength photometer”). The mechanism of the colorimeter is to shine a light through the sample being measured, and then electrically detect the amount of transmission. The measured data is indicated numerically using A/D converters (analogue→digital converter), calculated by CPU, and the results are output. BioMajesty™ offers high dispensing performance of sample and reagent, reduction of residual water to the minimum, due to a cleaning mechanism for the outside of the pipettes and measures to eliminate residual-water in the reaction cells, and acquisition of good accuracy measurement data. BioMajesty™is a clinical biochemical analyzer that contributes to clinical testing by achieving ultra-high-speed processing with ultra small volumes of reaction fluid. It has been used in small and medium-sized hospitals and test centers (non-governmental agency dedicated to analysis of patient samples), as well as large hospitals, such as university hospitals, etc. The ultra small volume measurement function is expected to contribute to the development of test items, such as for immunity, tumor markers, drugs, infection markers, etc. as well as to the development of pharmaceutical products. 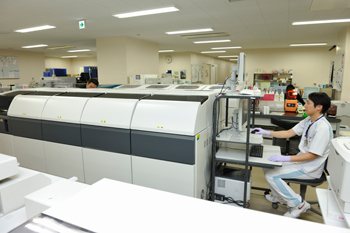 Photograph: Courtesy of Clinical Department, Kitasato University Hospital.